As more listings hit the Oro Grande market I wanted to tell you about one specifically that we just listed. Have you ever been driving down National Trails Highway and seen the white archway to the east? The archway leads down Elderberry Drive. If you turn down Elderberry and go under the archway approximately 1,300 feet down Elderberry is this prime 3.12 acre property. As you travel down the road you will notice other custom built homes on acreage to your right. Oro Grande is located in San Bernardino County north of Victorville and south of Helendale along Old Route 66. The property is surrounded by other vacant land properties as well as newer homes and mobile homes of 2.5 acres or more. The property has electricity nearby and is ready to build your custom dream home. Directions to the Property from Victorville, CA- When traveling north on the 15 freeway, exit on ‘D St.’ and make a left onto D St. D St becomes National Trails Highway (Old Route 66) and continue for approximately 9.5 miles, turn right onto Elderberry Drive and continue for approx 1,300 feet. The property is on the right side with white poles with pink tape marking the approximate location of each corner. One of the biggest features of this property is that the seller is offering to carry the financing. The terms are $4,000 down (20%), a loan amount of $16,000 amortized at 6% interest for 15 years. Your monthly payment is approx $135 per month or more until paid. 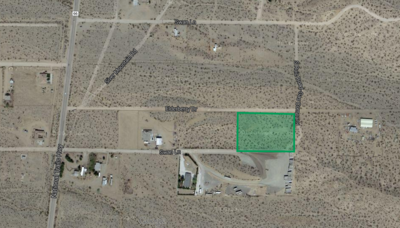 You could own 3.12 acres in Oro Grande for $135 per month. What an incredible option! The area has miles upon miles of open desert for off road, dirt bikes, bmx, horse back riding, or just some open spaces for a little time away from the crowds. Build your dream home with space for your hobbies, there is plenty of room on this property for animals or that garden you have always wanted.